Visitors like to go to Thanh Ha Pottery Village by bike. Here tourists can walk along the riverside or rural roadsides and visit charming pottery – kilns. You may be so hungry after biking along ten kilometers so do not worry your stomach will be well treated thanks to so tasty local specialties including leaf – shaped cakes, ‘Khot’ cake, rice glutinous cake filled with shrimps which is best served with gently pungent fish sauce. The food is usually sold by old ladies sitting on the roadsides. You may surprise why the food is so cheap. The old lady said “That’s so! The shrimps are fished right at the near river”. Old streets in Hoi An is also a place of interests for tourists to taste delicious sidewalk food and listen to unpopular stories about the long history and culture of the old city. Near the river mouth in Cam Nam there is a kind of mussel which is small and tastes good. A simple yet delicious dish made of such small mussels, rice pancakes is famous in Cam Nam together with ‘Dap’ cake and corn porridge. You can enjoy the dish while sitting on the riverside and viewing the stunning scenery which is all about the charming wooden bridge across the river, locals riding old bicycles in a hurry, kids taking a shower on the riverside and mussel fishers working near there. The scenery can be seen in many places in Vietnam but the dish made of mussels can only be found in Cam Nam in Hoi An. On the sidewalks on Le Loi St. and Tran Phu St., you may encounter food shops which sell rice vermicelli served with roast pork or boiled pork’s ears and seasoned with shrimp paste. One who tried the dish once can never forget its tastes. I still remembered every time I passed by such streets I would love to taste a bowl of spicy delicious noodles seasoned with shrimp paste in a rainy spring afternoon. Hoi An’s shrimp paste tastes gently pungent, sweet and salty at the same time. The dish is also less expensive however less popular than others. But those who like such dish can usually eat two or three bowls each time. Thought the dish is quite similar to noodles served with salted fish (or shrimp) sauce in Central Vietnam such as Hue and Da Nang, it is still unique because of the chilies and the basil grown in Tra Que villages in Hoi An. Even the Japanese like herbs in Tra Que villages very much so that some Japanese company has been leasing lands in Tra Que villages to grow basils and then export them to Japan. 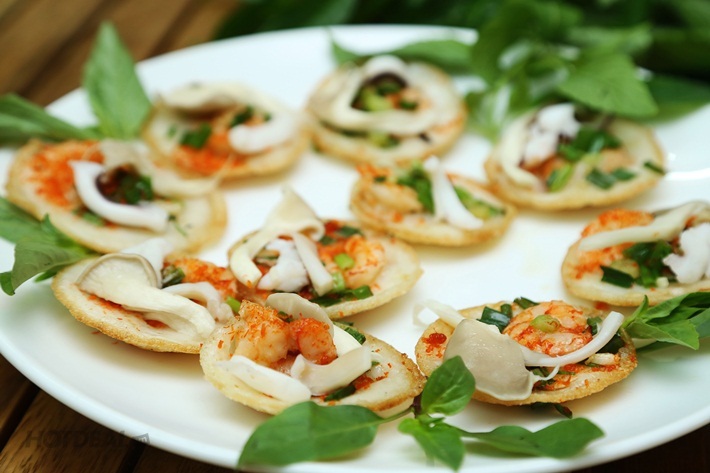 Visitors who have ever visited Hoi An must be strongly impressed by its local specialties. Sidewalk foods give spotlights on the long historical and cultural rich Hoi An cuisine. Street food is the go – to place for eaters and drinkers, locals and strangers, story tellers and listeners, and so forth. Hoi An is a busy crowded town but also a beautiful charming countryside.